The Senate and the House of Representatives grant the President’s request to extend martial law in Mindanao until December 31, 2017. A total of 261 lawmakers voted in favor and only 18 are not in favor. 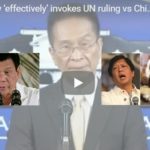 Bongbong Marcos already said that it is necessary to battle international terrorism that starts to set a foot in Marawi. 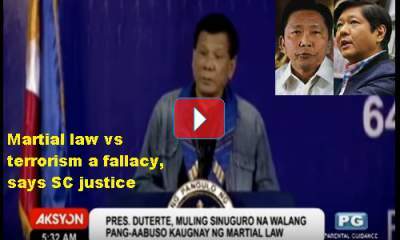 While Supreme Court Associate Justice Marvic Leonen thinks it is counteracting terrorism with martial is a fallacy. 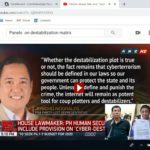 [VIDEO]: Ayon sa Korte Suprema, mas matimbang ang kaligtasan ng publiko kaysa sa sentimiyento kaugnay ng mga naging pag-abuso noon sa ilalim ng batas militar. A majority vote of the two chambers voting jointly. At least 158 of the 314 members of Congress, was needed to pass the motion. A total of 279 lawmakers, 20 senators, and 259 congressmen were present at the Batasang Pambansa to cast their votes. This includes Senator Leila de Lima who serves a prison sentence in Camp Crame for drug charges. To impose martial law to fight terrorism is a “fallacy” or a deceptive wrong move, according to Justice Leonen. He is the lone dissenter in the landmark ruling of the Supreme Court that upheld the constitutionality of President Du30’s martial law order in Mindanao. The court spokesperson on announced that the magistrates voted 11-3-1 to support the constitutionality of the President’s declaration. It throws out three petitions that questioned the factual basis of the emergency. Three other justices partially agreed with the decision including Chief Justice Maria Lourdes Sereno. 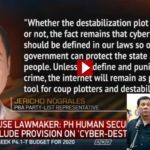 Bongbong Marcos said that the extension of Martial Law is not the problem. Thinking that international terrorists are gaining a foothold in Mindanao particularly in Marawi, this is not an easy problem. This is even a global threat. The President must have the power to command the military in full scale without apprehensions. The palace, however, assures the public that military abuse is unlikely. The majority of the public during this administration simply trusts the popular president’s discretion. Justice Leonen’s experience in governance is not at par with Bongbong Marcos who has served both in the Senate and in the local government who is still hands on to the situation of the on a bigger scale. Not to mention his close experience during martial law under his father’s regime. By now, he has gained the wisdom on what to do and what not – as the President’s successor choice. 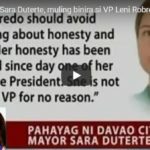 He backed the president up whenever he is interviewed with regards to his electoral protest against VP Leni Robredo. Next post: Can the Congress Stop Bullying ‘Ilocos 6’, Imee Marcos Now that the Missing Documents are Traced?